The M24 SWS has been the US Army standard issue Sniper Rifle for over 20 years now and it has done a great job, especially for a quickly developed weapon system. I loved the ones I used during my time and it has had a very successful service life and continues to do so, especially with the recent news that the US Army will be rechambering them in 300 Win Mag. But the recent combat experience in Iraq has changed the operational deployment of snipers within the US Army. The US Army found that their snipers were engaging in much closer and faster paced engagements and many of the sniper teams were getting most of their kills using sound urban sniping tactics combined with their M4 and M16A4 rifles (especially with the 77gr ammo). It became apparent that a new rifle needed to be added to the inventory that would better suit the needs of the modern urban combat zone as well as the traditional sniper role. The US Army put out a request for proposals and received prototype rifles to be tested for the SemiAutomatic Sniper rifle System (SASS). Knights Armament Company (KAC) has been building the SR25 in various forms, such as the Mk11 Mod 0, for various Special Operations units for a number of years and this experience and history played a role in their rifle being adopted as the XM110 SASS in 2005. The US Army had specific requirements for sound suppressors and other features and the KAC made the required changes to their SR25/Mk11 rifles to meet these requirements. The rifle moved from Experimental (XM110) to standard (M110) a few years after the 2005 adoption date and with it came a few changes including an adjustable buttstock for length of pull only, sling swivel sockets or flush cups, a double sided bolt catch, and a button on the folding front sight to allow it to be locked into position. After many years of M1C’s, M1D’s, M21’s as the US Army’s primary sniper rifle, the M24 SWS was a return to a bolt action sniper rifle for the army. The M110 now brings the Army back into the realm of semiautos. The operation of the M110 is very similar to the M16 which the Army likes to do to reduce required training but there are downsides to a semi-auto. Some of these downsides are that they are not as well suited to the traditional sniper role due to their shape and the fact that they fling brass all over the ground which can compromise your position and potentially leave target identifiers, not to mention getting your ghillie tangled in the action of a semi-auto is never fun. But one of the things the US Army was trying to address was getting more firepower on target with quicker follow up shots which the Semi certainly will do better than a bolt action. Another new feature with the M110 compared to the M24 is the addition of a suppressor as part of the platform. The combat experience in built up areas (Urban, MOUT) showed the need for suppressors to aide in the protection of the snipers by deception and concealment. The suppressor has developed into an integral part of many sniper teams over the past decade and I feel this is a good move on the part of the Army and the M110 requirements. The M110 suppressor is a stainless steel unit that is 14.25″ long and weights 1.96 lbs, is a quick detachable design and is rated at a 30 db reduction. While full power loads do still produce the sonic crack from the bullet, the report of the rifle is greatly reduced and determining the direction of the shooter from just that crack is very difficult. The M110 has a shorter 20″ barrel which means that adding the suppressor to the rifle makes it just a few inches longer than the M24 and the weight is very similar. Having that added advantage of the suppressor is nice to have and yet it is also quickly and easily attached, or detached, to the rifle adding additional flexibility to only use it if you need it, though you best keep track of your point of aim change when the suppressor is on vs. when it is not. The Day Optic Device (DOS) is the Leupold Mk4 3.5-10x40mm with M2 knobs, Illuminated TMR reticle and finished in earth brown. We reviewed this scope a number of years ago here: Mk4 3.5-10x40mm Brown. The M24 used the Leupold Mk4 10x40mm Ultra M3 and it is an excellent scope, very durable and high quality. This new scope on the M110 continues the partnership with Leupold and is a very good scope with good flexibility which includes a BDC elevation knob calibrated for the M118LR ammo. The elevation clicks are .5 MOA per click compared to 1 MOA per click on the M24. This requires that you overlap more than one rotation once you get beyond 800 meters on the BDC. The knobs on the M24 goes to beyond 1000 meters in less than one revolution, but you get the better granularity of adjustment with the M2 knobs on the M110. The scope is also a variable power which is more useful for the defined role the M110 was expected to operate in, closer but more rapid engagements. Being able to dial down to 3.5x gives you a lot bigger field of view but still makes you extremely effective to about 500 meters. The one thing I thought the scope could of benefited from was a FFP reticle so that you could not only mil your targets on any power, but also use your mil hold offs for moving targets, windage, etc. Not to mention, in the stresses of combat, it would be nice not to have to remember what power you are set at when holding off or estimating range. 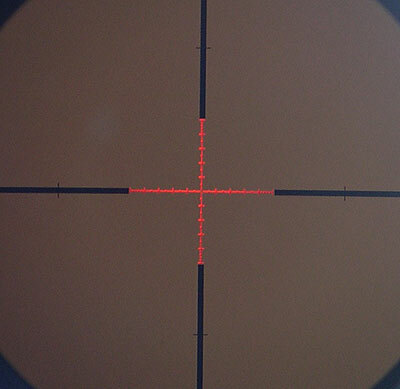 The reticle on the M110 leupold scope is an illuminated reticle, and yes, it does introduce something else to break in the field, but the reticle will continue to work if the battery dies or the illumnation fails, it just will not be illuminated. The illumination does help with low light conditions, something that is nice for all combat conditions. For when the light is no longer low, but rather non-existent, the M110 is setup to accept the AN/PVS-26 Universal Night Sight which is mounted in front of Leupold scope. The PVS-26 is a high power night vision scope that essentially adds night vision capability to the standard DOS and does not impact the point of aim of the DOS. When the M24 was designed, this type of technology did not exist, and it is excellent to include it on this rifle. This allows for easy conversion to night capability without altering any zero data. Of course, some weight is added but the increased flexibility and capability of the rifle is another added benefit for the rifle. The full rail along the top of the rifle does allow for the future use of additional new devices in the future to further expand its capability, which of course includes swapping scopes in an emergency or even mission specific DOS. The US Army actually recommends a break-in period for the M110 which is an indicator that those responsible for the documentation and adoption of the M110 is aware of modern firearms practices. They also have a few other interesting recommendations for the M110 in which they state the barrel life should be better than the 5000 rounds of the M24 (the M24 routinely goes beyond that 5000 rounds). 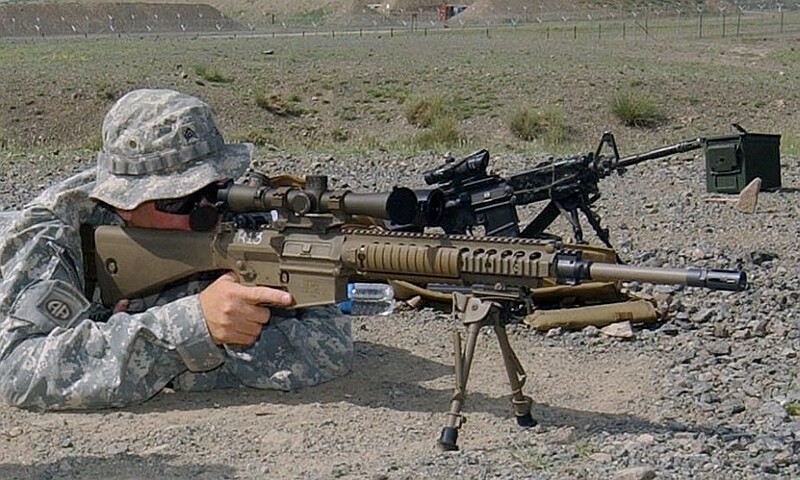 The US Army also advises that to preserve the effectiveness of the QD suppressor, that the sniper not fire more than 20 rounds of sustained fired through the suppressor which equates to 5 rounds a minute for 4 minutes. In a sniping environment that should not be an issue, but there are times in combat where this may become an issue during a firefight. Of course, there is no such limitation when the suppressor is detached. There is a set of backup iron sights (BUIS) that consists of a rear match grade style peep aperture and front iron sight, both the front and rear sights fold and are fairly accurate. The sights also can stay mounted on the rifle when the scope is mounted and do not interfere with the scope. This is a nice feature to have that the M24 could not do. Not that you use the back up sights much, but it is still nice to be able to zero them, and then leave them mounted when you put the scope on for use when all else fails. As mentioned earlier, the operation of the M110 is very much like the M16 and will be very familiar to the any soldier, with just a few differences the additional training is quick and the sniper should quickly be up to speed. Accuracy of the M110 has been good with typical accuracy between .5 – 1.0 MOA depending on ammo. The M118 (Special Ball), M118LR and M852 (168gr) ammo have all been approved for use in the M110 and in combat. The max effective range is listed by the US Army as 800 meters or longer depending on the skill level of the shooter. As many 308 shooters know, that max range is largely weather dependent as well, but with M118LR ammo and a good sniper, I would put that max effective range at 1000m or so. These rifles combined with M118LR have been good performers. One question that was not initially answered with the original order of XM110 and M110 rifles was whether this was a replacement for the M24 or not and the Army was somewhat unclear on the matter. The initial order of M110’s was far fewer than there were M24’s in service so it was my personal opinion that it was going to be fielded as a complimentary rifle to the M24 and not a replacement. As time went on, the Army was indicating it as a replacement, but yet no M24’s were removed from service and the numbers were still far too low to be a replacement. As it turns out, the M24 SWS was recently given new life with the announcement that the M24’s would be converted to the 300 Win Mag cartridge and that the M110 and M24 would work side by side. I am not sure how many sniper units will get both systems and exactly what the time frame is on the M24 conversions, but I do know that this tandem of rifles should make an excellent battery of rifles to use for a given sniper team. These two rifles together should cover a very wide assortment of shooting and combat conditions that a sniper team would find itself in. With the announcement of the M24 conversion to 300 Win Mag also came the adoption of the Mk 248 Mod 1 ammo which uses a 220gr Sierra Match King bullet launched at 2850 fps. This will greatly expand the range of the M24 up to potentially 1500 meters and provide a traditional bolt action sniper rifle. The M110 then will fill the role of a closer in, higher firepower rifle with suppressed capability that will work well in urban, closer range, and more intense combat scenarios. Together, you have a very formidable duo of rifles. I like this setup for our US Army snipers as it provides them with a lot of flexibility and capability, exactly what they need. Writing a book and just want background knowledge. Would love to talk to any living snipers. Old skool sniper from 101st Pathfinder Det. & spent 7 other years teaching at Campbell, Benning & Robinson. I have a Barrett 98B setup with a NForce NXS 5.5-22x56mm scope, with the BORS unit, and I am looking for a night vision scope to compliment this set up. I want a clip on day/night set up so I don’t have to worry about rezero issues. What does the military use for long range night scopes? and what are the extent of their range…? I am seeing about 400m is about the norm for long range clip ons but there is so much trash on the net, I can’t be sure I am getting reliable info. Thanks for any insight you can offer….And I was a 3rd MAW U.S. Marine…Semper Fi…Do or Die! 20″. All of the rifle stats are located on the far right of the review. Mel, Does your estimation for the max effective range being 1000m+ include or exclude use of a suppressor? Also, what was the reasoning for rechambering in 300 Win Mag? I am new to shooting and am looking for a good platform. Thanks for your time. Yes it does. Provided you use standard full power loads with the suppressor, the effective range will not be effected with or without the suppressor. The point of impact will shift a bit, but that is a known and can be accounted for each time. Obviously, if you use subsonic loads with the suppressor, it drastically limits the effective range, making it 200 yards or less. The switch to 300 Win Mag is to stretch the range even further. With modern 220gr loads, the 300 Win Mag can reach past 1500 yards reliably. re-barreling, the weight differential for ammo is not that significant of an issue. Was cost and availability of ammo a major concern. I have fired both rounds, but prefer the 338 Lapua for longer ranges (1000+ meters). Just saying, if you are going to chamber a tactical rifle, to be used by marksman ands snipers on targets in both Urban and longer ranges exceeding 1000 meters, I do not see the advantage of the 300 Win Mag over the 338 Lapua based upon ballistic coefficients of the rounds. In close quarters, both rounds may be over-kill. Within the 100-800 meter distances, the 338 Lapua still delivers superior kinetic energy to its target compered to the 300 Win Mag. Unless, you are designing the M110 SAS for the 100-800 meter range targets in mind, and deferring to a different rifle platform for extended ranges, I do not see the practical advantage of using the 300 Win Mag. The two rounds are similar, with the 338 Lapua apparently being the superior of the two. Yes, in terms of raw ballistics, the 338 Lapua, especially with the heavier 280-300gr bullets, is superior to the 300 Win Mag. With that being said, rifle procurement decisions are not just made with “the best” as the only criteria. If that were the case, every sniper rifle would be a 50 BMG or something similar. But the intended role of the rifle does play a big part. The size of the rifles have to grow with the size of the round which becomes a big restriction on a duty issued sniper rifle. A 338 Lapua rifle is considerably larger in every way than a 7.62 sniper rifle and if the intended role is a SASS platform, then it becomes even more difficult as the semi-auto receiver and operation has to be able to handle the immense pressures and beating the 338 hands out. In terms of the 338 vs 300 Win mag, the differences are less, but cost does play a factor and for the US Army, it already had a plethora of M24 bolt actions that could be fairly easily converted to 300 Win Mag, but they could not so easily be converted to 338 Lapua (limitation of the Rem 700 action). The 300 Win Mag rifles can be, and usually are, a “bit” smaller than 338 Lapua rifles (excepting rifles such as TRG-42 which are chambered for both) so there is some advantage there and the 300 Win Mag with 208-220gr bullets perform very well and are nearly as capable as the 338 Lapua up to about 1500 yards, after that the big Lapua runs away from it. But a vast majority of the sniping is handled at lesser ranges, such as with Chris Kyle and his 300 Win Mag rifle. What it really comes down to is the mission of the rifle and the requirements it has to fill. There is a place for the 7.62, the 300 Win Mag, and the 338 Lapua in dedicated sniper rifles today. Typically, normal, full power ammo, goes transonic, from super sonic to subsonic at 500-800 yards depending on the ammo. The bullet then gets a ‘slap’ as it goes through the sound barrier and tends to start to wobble. Subsonic ammo can be quite effective out to 500+ yards depending on the shooter, round, and experience. An unknown was shooting antennae off large radios mounted on enemy vehicles ‘recently’ in the ‘sand box’ and after the antennae was down, then drop the people in the vehicle before they could radio the vehicles in the column in front of them so the entire column was drained, one vehicle at the rear until the 2nd to last blasted the lead with a squirt of automatic weapons fire in the tail to get their attention. Key is shooter, platform, and ammo. Shooter is brains, hold, and breath control, finally squeeze. Even a little 22lr can make a very good shooter in the limited range and cost – consider before you do the equivalent of 700 horsepower on a road you will never go more than 60 on. Whats the max effective range on these? There is no official max effective range, but I would say 1000 meters knowing the accuracy of the rifles and competency of the operators. Ive hit a standard e-type target at 1100m with an M110. Not consistently, mind you, but it can be done. It can reliably hit targets at 800m to 900m.